The 3D modelling CAD revolution has affected the design of all manufactured products and its use is now something of a manufacturing industry standard. SketchUp - also known as Google SketchUp - is a 3D modelling program intended for application to a range of design areas such as architecture, civil and mechanical engineering as well as video game design. The package is available in a free version as well as more highly specified 'professional' versions that are charged for. Perhaps because of its speed and simplicity of use it has been taken up by the woodworking community in recent years and appears to be a relatively commonly used tool within the craft. One of the key claims of the developers is Sketchup's ease of use and the availability of an online repository of model assemblies, such as cabinets, toolboxes, windows, doors and many other objects besides. This is known as 3D Warehouse and it enables any designer to locate, download, use or contribute free models amongst other features. Is this a really useful 3D CAD modelling tool for most woodworkers and, if Sketchup is so easy to use, why would anyone need a DVD to show them how to use it? 3D modelling is a very powerful tool for those who know how to manipulate it well and it may well save many wasted hours in the workshop for those who adopt it. Even more importantly it can enable visualisation and adaptation of a design long before any expensive material is cut. But, it should be noted that, like many software packages, Sketchup does not come with its own traditional instruction manual but does offer online tutorials. This DVD is therefore for those who are unfamiliar with working in a 3D CAD package and it does a very good job of showing the basics in easily understandable language. It shows users how to set up the program, to make a solid shapes - 'extrusions' - and how to cut and shape them on screen. Dave Richards goes on to show how to add components together, to finalise the 3D model and to turn this model into a set of workshop drawings. Whether you are a raw novice who is nervous of cutting stock or a master cabinetmaker taking their first steps into 3D modelling, this DVD will put you on the right path with this program. It covers all of the operations that any designer would need to enable them to visualise a design and examine it from all angles. Although Sketchup does have its own online video tutorials, inevitably they tend to be much more generic than this production, which models a Shaker cabinet from start to finish. 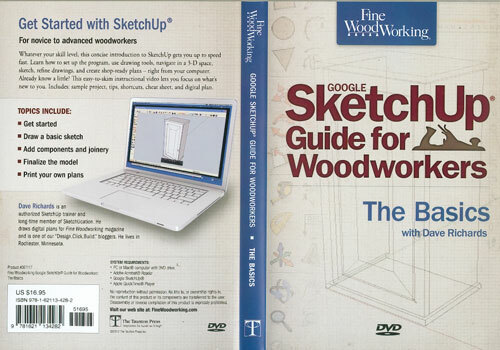 So, if you would feel more comfortable being guided through an actual woodworking project to get you started with Sketchup, this DVD is the way to go. Sketchup is a truly useful piece of software that can, with a little effort, genuinely alter the way you approach designing a piece of work. Go on - give it try!